...with no crop that year and no seeds in reserve, the family thought the cucumber was lost. The Collier’s daughter, May, writes “He and mother believed that the cucumber line was gone forever. It was a sad day! However, miracle of miracles, next year a volunteer plant came up!” Graham caged the plant to protect it from birds and carefully tended it throughout the season. This single plant saved the variety from extinction. The Colliers donated this variety to Seed Savers Exchange in 1989, but prior to January 2012, SSE knew none of this history about Cucumber 62, ‘Collier’. Seed Historian Sara Straate obtained this story and more through conversations with the children of Graham and his wife Margaret. The cucumber was originally grown in Southern Indiana by Margaret’s parents, Arthur and Laura Mayne, who obtained the seeds circa 1910 from a migrant community traveling through the area. After Margaret and Graham married in 1936, it became a regular feature in their own vegetable garden. 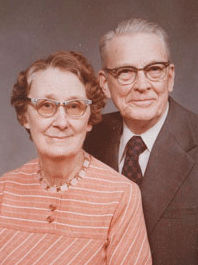 Possessing an exceptionally thin, white skin, the Colliers used it for fresh eating and pickling. This cucumber was the family’s favorite and the only one they grew. Preserving the fragile link between a seed and its story is vital to our mission to pass down our garden heritage to future generations. Seed stories honor the legacy of garden stewardship. Without the story, seeds lose part of what makes them individually distinct. Yet, with thousands of varieties in our collection, much work is still to be done. We urge individuals who have previously donated seeds to SSE to contact us. Your information may enhance our understanding of a variety’s origin, history, or cultural and familial ties. Please contact Sara Straate at sara@seedsavers.org (preferred) or by calling 563-387-5655. Additionally, you can support our efforts by making a donation, or by becoming a member. 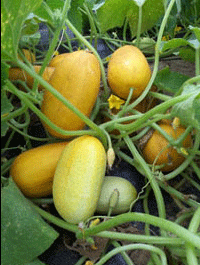 The Collier cucumber is also available for you to purchase and grow in your own garden!